On the other hand, around 2.5 million Syrians are living in urban areas across the country. Together with those accommodated in camps, the total number of Syrians under temporary protection in Turkey exceeds 2.7 million (2,758,409 registered as of 1 November 2016), which corresponds to about 15 percent of Syria’s pre-war population. With these figures, according to the UNHCR, Turkey hosts the largest number of refugees in the world. Since 2011, 178,000 Syrian babies were born in Turkey. The Syrian children who were born at the beginning of the war are now six years old. Turkey attaches utmost importance to their well-being and strives to give them a good start in life. The best interests of the children are taken into account and priority is given to those with special needs, particularly to unaccompanied minors. Turkey does not force Syrians to live in camps or any other place without their consent. This is one of the unique characteristics of our Syrian policy. Bearing in mind that investing in the education of refugee children is of critical importance, Turkey is making every effort to ensure that Syrian children attend school. We believe that they are the future of Syria and that they will rebuild a stable, democratic, and prosperous Syria. Out of the 835,000 school-age Syrian children in Turkey, 463,000 attend public schools and TECs. The school enrollment ratio in early primary education is extremely high, around 99 percent. Girls constitute 50.4 percent of the Syrian students. Our aim is to maintain these attendance rates in all classes. For this to happen, new schools and teachers are urgently needed. We do not have any time to waste as we do not want lost generations. The international community should act responsibly and take immediate steps to assist Turkey more actively in this matter. We have also taken the necessary steps to make the best medical care available to the Syrian community. All Syrians under protection can benefit from the Turkish health care system free of charge. To date, Turkish doctors have treated more than 20 million patients and carried out 780,000 surgical operations. The total number of Syrians under temporary protection in Turkey exceeds 2.7 million, which corresponds to about 15 percent of Syria’s pre-war population. Turkey has spent over 12 billion US dollars from the national budget. The total amount of expenditures has reached 25 billion US dollars, including contributions from municipalities and local NGOs. Nevertheless, the direct financial aid we have received from the international community is only 512 million US dollars. In addition to its efforts at home, Turkey has, since 2012, continued to ensure delivery of humanitarian relief to the northern parts of Syria through operations conducted by the Turkish Red Crescent at the border, in conformity with its international obligations and in support of the UN campaign. The total value of the aid channeled to Syria through these operations amounts to 535 million US dollars. Turkey has also cooperated closely with the UN to enable UN cross-border humanitarian operations into northern Syria since July 2014. In addition to Turkey’s own zero-point humanitarian deliveries, the UN has been able to regularly send cross-border humanitarian aid into Syria through the Bab el Selame/Öncüpınar and Bab el Hava/Cilvegözü border gates within the framework of UN Security Council Resolutions 2165 and 2191; and through the Nusaybin/Qamishli border gate within the framework of Resolution 2139. One should keep in mind that the generosity Turkey has shown towards Syrians and those in need of international protection is also reflected in the policies it initiates in its region in the field of immigration. The Turkey-EU Agreement of 18 March, constitutes a good example in this regard. 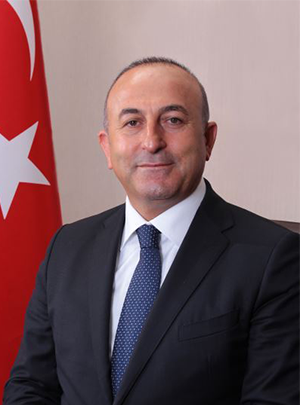 Turkey took the initiative in drafting the 18 March Agreement, which owes its success to our tremendous efforts in the Aegean Sea, not only through saving human lives and eliminating smuggling activities, but also in welcoming new migrants from the Aegean islands without any discrimination. Hence, in addition to the approximately 3 million refugees for whom we provide shelter, we spare no effort when it comes to creating adequate living conditions for these newcomers. As the country which has assumed the greatest burden with the largest refugee population in the world, we are also proud to find and show ways to alleviate responsibility through coordinated action. In this context, the 18 March Agreement can serve as an example to other parts of the world coping with irregular migration. Figures testify to its success and are indispensable in demonstrating its exemplary aspects. While in the same period last year 7,000 irregular crossings per day were taking place towards the EU, following 18 March we stabilized these flows with a sharp decline of one hundredfold. Although instability persists in our region, we were able to control migratory movements through Turkey. Syrian children are the future of Syria and they will rebuild a stable, democratic, and prosperous country. There is no doubt that the most important achievement of the 18 March Agreement has been the ending of loss of lives at sea. In 2015, the Aegean Sea claimed around 1,000 lives due to dangerous journeys towards the EU. The trend was even more brutal at the beginning of 2016 with around 400 lives lost in the first three months of the year. Since 18 March, 8 irregular migrants lost their lives in the Turkish waters of the Aegean. We will continue to do our utmost to prevent deaths in our seas. As a result, we have transformed the Aegean Sea into an area of stability and solidarity. We owe this accomplishment to our human-oriented approach which seeks a better future and destiny for those we host. Turkey is ready to share its experience with the international community and elaborate good practices in the fight against irregular migration. Turkey’s aim is not only to save lives and provide a safe harbor for the Syrians, but also to improve their living conditions and ensure their self-reliance. Their safety and dignity remain our priority. Consequently, we are creating favorable conditions for Syrians to actively participate in social and economic life. We have transformed the Aegean Sea into an area of stability and solidarity. Fundamental harmonization policies in Turkey are regulated by the Law on Foreigners and International Protection. In this regard, language courses, education, vocational training, labor market access, access to social and health services, social acceptance, anti-discrimination measures, xenophobia and racism are major components of Turkey’s integration policy. When we look at the situation on the ground, first of all, the Syrian people’s ability to live outside the camps obviates their isolation. The vast majority of them live in different provinces side-by-side with Turkish society. Our citizens show empathy and welcome their Syrian sisters and brothers who have fled the war and violence in their country. Our Syrian brothers residing in Turkey have an invaluable chance to enrich the human capital in Turkey. Thanks to this approach, the guest community interacts with the host community and socializes better. Hence, we have been able to overcome prejudices or acts of intolerance successfully. This is an important contribution to social cohesion and peace. We believe that anti-migration and anti-refugee movements could be overcome with such policies. With regard to their economic integration, Turkey allowed Syrians to access the labor market as of January 2016. We also prioritize vocational training especially for the Syrian youth. To date, over 75,000 Syrians have attended these courses and started to build their future and make a life of their own. Indeed, refugee integration is an important aspect of migration management. Well-managed migration has benefits not only for migrants themselves but also for countries of origin and destination. Therefore, our Syrian brothers residing in Turkey have an invaluable chance to enrich the human capital in Turkey. Like Turkey, all countries should assume responsibility for supporting the integration of migrants, counteracting the phenomena of discrimination, racism and xenophobia, and strengthening the positive impact of migration on development, both in countries of origin and of destination. Based on the unique and honorable experience of my country regarding refugees in general and the Syrian case in particular, we call upon the international community to reflect on and contribute in the following ways to address the ongoing crisis. The countries bordering Syria, primarily Turkey, have so far assumed an unfair share of the humanitarian burden of the Syrian conflict. They should not be left alone in coping with this humanitarian crisis, which requires a genuine partnership among all members of the international community. Concerted global action is urgently needed. Geographical proximity should not be used as an excuse for making the countries neighboring the regions of conflict solely responsible. The international community needs to share the responsibility and the burden equitably. Tangible and continued financial aid should be provided for refugee hosting countries struggling with huge numbers. All countries should provide protection for those who need international protection, so that genuine asylum-seekers can exercise their rights emanating from relevant international conventions. Functional, quick and equitable resettlement programs for the refugees are necessary. Resettlement is a chance given to the refugees to make a fresh start. It facilitates the movement of refugees in a legal, safe and orderly manner. If enough places are secured through this channel in a timely fashion, people would not opt for irregular migration. Granting temporary protection could be another option for many destination countries which have concerns about granting refugee status to asylum seekers for internal political reasons. Refugees should not be considered a security threat. Doing so only results in more securitization of migration and restrictive policies. Closing borders and building fences are temporary measures that ignore the core of the problem and do not change the fundamental reasons for mass migration. Receiving states should adopt inclusive and anti-discriminatory policies to counteract xenophobic and racist tendencies. Last but not least, in order to find a durable solution to the migration crisis we have to address the “root causes” of massive waves of forced displacement and support peace processes and promote peaceful settlement of disputes in conflict-ridden areas. But even more importantly, in responding to the refugee crisis, we should never forget that we are not dealing with statistics but human beings who need protection. It is humanity’s joint responsibility to find sustainable solutions by putting our human values first.